Mrs. Ator has been accompanying the Fort Wayne Children’s Choir since she traveled to Shrewsbury, England with the FWCC in 1999. She feels extremely privileged to work with our talented singers and directors. Mrs. Ator is in demand as an accompanist and as a private piano and organ instructor. She spent twenty-five years in church music ministry and continues to spend many Sundays on the bench subbing for her colleagues. In the early 1980s, she became the organ instructor at IPFW and currently also accompanies voice students at PFW. 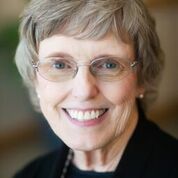 Mrs. Ator has served as the organist and harpsichordist with the Fort Wayne Philharmonic since 1981. She holds a Bachelor’s degree in Music Education from Indiana University, and she continued to organ study with Russell Saunders at the Eastman School of Music in her hometown of Rochester, NY. Married to Jim, a retired IPFW Music Professor, she is the mother of three sons and two step daughters, grandma to four grandchildren, and a great grandma to one, with his sibling due in August!